Puccini’s La Boheme is popular beyond comment. It has been performed 1295 times by the Met since the company’s first performance of the opera on tour in Los Angeles in 1900. Incidentally, Los Angeles was also the site of the work’s American premiere three years earlier. Aida is far behind in the Met’s second spot. There’s not a weak note in Puccini’s masterful score. One highlight follows another. One of the opera’s great moments occurs at the end of Act 1. Rodolfo and Mimi have rapidly fallen in love. Each sings a biographical aria after which they declare their newfound love in a rapturous duet. This duet requires delicacy and restraint, especially from the tenor. The duet ends on the word ‘amor’ sung by both tenor and soprano after they have left the stage to join the other Bohemians in an outdoor supper on Christmas Eve – in Paris after sunset! Okay, it’s opera. But remember that the opera starts with Rodolfo and Marcello kvetching about the cold in their garret. So going to an outdoor dinner doesn’t seem like a good idea even by the standards of opera. The soprano’s climactic note in this duet is a high C marked pp and perdendosi (dying away). This soft singing is hard, but there are always sopranos who can do it. The tenor’s note has the same markings, but is a middle C. There are almost no tenors who can sing a high C with the directions provided by the composer, which obviously is why he wrote the note the way he did. Tenors being what they are often elect to take the high C with the soprano. This irresistible urge commonly results in a screaming match between the two. The Italian words are below followed by an English translation. If a tenor is going to ignore Puccini’s instructions and take the high C, he should have one like Giuseppe Di Stefano had in 1951. This duet (O soave fanciulla Di Stefano Albanese) is taken from a single LP disc of 8 highlights from the opera. The other singers on this now very hard to find recording were Licia Albanese, Patrice Munsel, and Leonard Warren. Warren never sang Marcello in Boheme onstage. It was too small a role for his great voice and equally grand ego. Since this disc is virtually impossible to find the following link will allow you to download the entire recording. 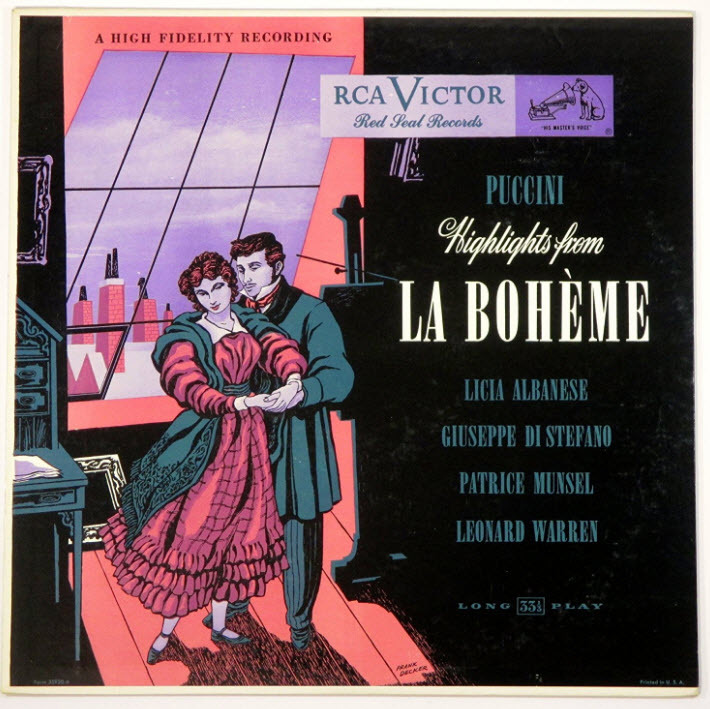 La Boheme Albanese Munsel Di Stefano Warren The tenor-baritone duet (the only one Puccini ever wrote) is terrific and alone make the recording worth having. Ecc Nel baccio freme amor! Di. Se venissi con voi? Che? Mimi! Vi staro vicina! E al ritorno? Curioso! With moonlight bathing your pretty face! The dream that I see in you is the dream I’ll always dream! Our kisses shudder with love! Speak! What if I went along? What? Mimi! I’d be right beside you! What about later? Who knows, sir? I have that tv clip and they both look sooooooo happy!! !